What new services would you like us to offer? (5 minutes from Greenhills, East Maitland). Are you looking for a new style or just maintenance of your existing style? At Exhilarate we are not purely dictated by the latest styles and fashion. Speak to our stylists who will work with you to decide on the best hairstyle for your face, your lifestyle and how much time you have to maintain your hair. Tinting, Foils, Highlights or Lowlights, Semi-permanent Colouring and Seniors Colour & Styling. We also offer hair extensions and Balayage. We use exclusively VitaFive CPR hair colours for their ability to repair and revitalise your hair. We offer a Free Fortify treatment with every colour service! Parking is usually available right outside the door! From men’s and women’s haircuts and hair color services to conditioning treatments and special event looks, Exhilarate offers a full range of hair services at affordable prices. Our professional stylists care about your hair and will help you find the hairstyle and services that fit into your day and your life, whether it’s a quick trim or a completely new look. With over 20 years experience we have extensive knowledge in cutting and colouring hair to give you exactly what you want! We regularly update our training to make sure we use the most up-to-date techniques and the most beneficial products. 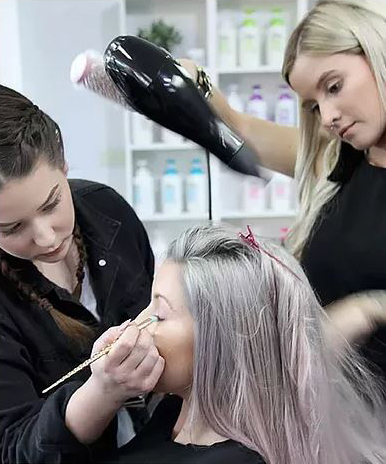 Our professional hairdressing salon is located in Tenambit and conveniently located close to suburbs such as East Maitland, Morpeth, East Maitland, Ashtonfield. Hinton, Wallalong, Rayworth, Chisholm, Thornton, Seaham, Lorn, Largs, Duchenfield, Berry Park, Paterson, Woodville, Phoenix Park and Maitland. Phone Megan on 49 334451. Hair Cutting, Styling, Colouring – Flattering styles and vibrant colours to suit YOU! After researching and testing many different products on the market we have selected a range of products that is Australian made and guaranteed to improve the condition of your hair and give vibrant long lasting colours. We use the VITA FIVE CPR range for hair colouring, tinting and hair treatments.